in Houston, TX. In 2003, this little ol’ band from Texas was inducted into the Rock-n-Roll Hall of Fame and in 2007 they were honored on VH1 Rock Honors. Their music and their legend speak for themselves. 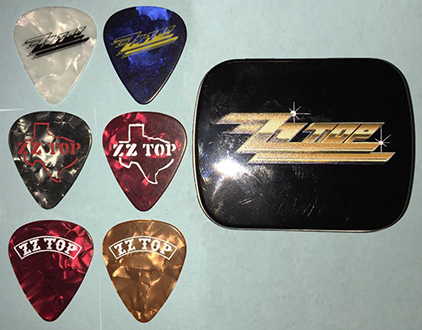 This reference guide of ZZ Top guitar picks and drumsticks is my little way of saying "muchos gracias" to Billy, Dusty and Frank for a soundtrack that's lasted a lifetime. All of these picks shown on this page are in my collection except for the few described in white. I am very interested in obtaining these picks if you or someone you know have them to offer! Feel free to contact me if you have one of the ones I need! Promotional picks put out by the finest unofficial ZZ Top fan page in existence, The Little Ol' Web Page from Texas. Promotional picks made by Hot Picks USA. These were given out for free at the 2012 Winter NAMM. Not sure if these were done as prototypes to try and sign ZZ or if an actual merchandise license actually existed prior to the Dunlop license? Not a lot of info on this one. Was told it was "made by a fan for a framing project that never got off the ground". Don't ask what that means, because I have no idea. Cool pick though!